The color 'rebeccapurple' with the RGB hex code #663399. I was just reading about the color data type in CSS over at MDN when I saw that a new named color will be part of the CSS Color Module Level 4. There was a link to this Codepen blog post. Rebecca was Eric Meyer's daughter. She was diagnosed with cancer. On her sixth birthday she left us. 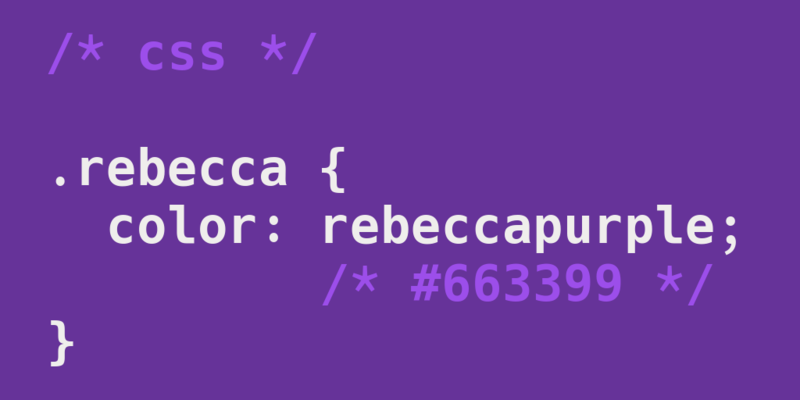 This past Friday, June 19th, 2014, the community to which Eric has given so very much has seen fit to name #663399 as rebeccapurple with his permission. Eric Meyer is probably most well-known for reset.css. More TIL: Btw the changes for CSS 3 to 4 are also interesting from a technical perspective: https://drafts.csswg.org/css-color/#changes.